really wear anymore – there's no occasion to wear the item or it doesn't fit. Today, let's talk about what to do if all the clothes you have you like, fit in to and in theory would wear, were you able to easily get to them. A much more difficult conundrum! First thing's first – make sure that everything you're looking at does fit and is still the style of clothes you're comfortable wearing. 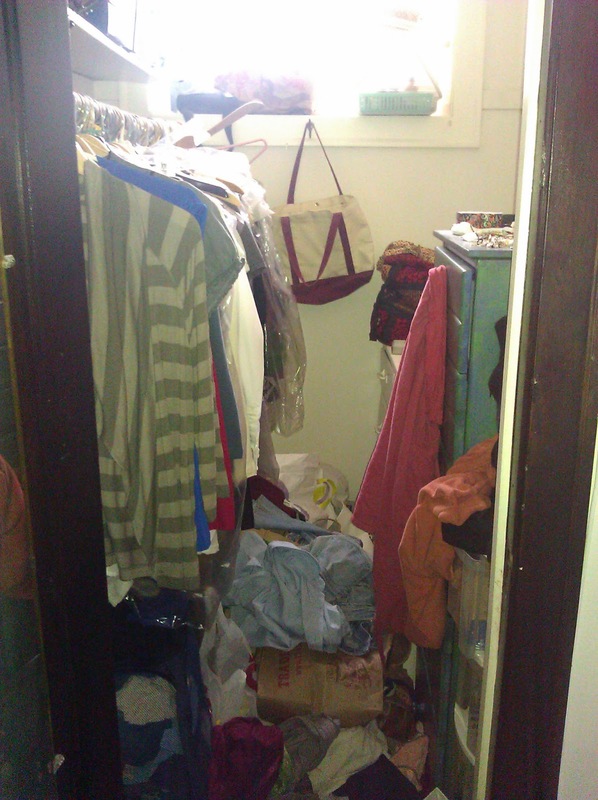 Next, pull it all out of that closet! 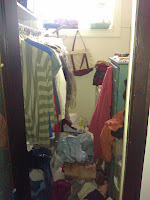 And, the dresser, too; clear the floor of clothes, too! 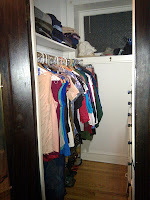 Make piles of clothes categories: pants, skirts, dresses, tops, sweaters, underwear, socks, belts....anything and everything you come across in clearing out that space. Put everything that belongs someplace else (like the laundry room or the mudroom) in a basket near the door. You can deliver those items later, when your clothes project is done. How often do I do laundry? If it's once a week, technically, you only need enough clothes for about 10 days. If it's once a month, you need about six weeks of clothes in your wardrobe. How many times a day do I change clothes? Maybe you go from pajamas to work clothes to pajamas before bed. Maybe you go from pajamas to workout clothes to work clothes to lounge wear to pajamas. Knowing how many outfits go on and off your person in a day is helpful. How often do I need something outside of my ordinary wardrobe, like formal wear or a business suit? If it's once a year, maybe you need two options. If it's once a month, six or seven might be more reasonable. Most importantly, keeping the answers to the above questions in mind, how many _____ is it reasonable for me to have? T-shirts, pants, dresses, fill in the blank. Knowing how often you're changing clothes and doing laundry will give you an idea of how many of each item you go through before it's time to do the wash again. Be honest with yourself. And, answer this question without looking at your piles!! If helpful, write down your answers, to hold yourself accountable with the next step. For some people, having three or four t-shirts is plenty, because they rarely wear them. For others, it's part of a daily wardrobe, and wash gets done about every 10 days. Having 15 or so t-shirts is more realistic for this person. Now, as you go through your categories of clothes, count how many you're starting with. Let's say the reasonable number of t-shirts to own is 15, but the pile has 32. We've got some work cut out for us! Go through the pile once, tossing t-shirts into a donation bag that are the easiest to part ways with. Now how many are left? 20. Go through once more, trying to donate another five from the pile. Perhaps, you're keeping some because it's from a special event (like a race or organization), but you actually never wear it. Then, these t-shirts should not be considered part of the 15 keepers. These t-shirts should be set aside to pack up with memories. Maybe, now you're down to 14 shirts! Hooray! If you really feel strongly about it, pick one out of the donate bag to complete your desired 15 t-shirts. Otherwise, have a little wiggle room; you can always get another t-shirt, right? So, there is a number of each type of clothing item that everyone should have. It's just a different number for each person. Remember, you made those goal numbers, so you should stick with them. Otherwise, you're going to just fill the closet back up again with no sense of up or down!